Little Weirdos: Mini figures and other monster toys: Warriors of the Galaxy: '80s space fantasy weirdos! Warriors of the Galaxy: '80s space fantasy weirdos! This post is a quick update to one from a little while ago. In that post, I talked about an obscure early '80s fantasy/space-themed playset from Marty Toy called Warriors of the Galaxy. The photos I included showed bootlegs of figures from the playset, but since then I've gotten a set of the real things from the Marty Toy set! Check them out above. There are 12 figures total--six heroic characters in gold plastic, and six monster/villain characters in silver-gray plastic. As usual, the monsters are the more interesting ones, boasting some pretty cool designs that remind me of retro, '60s Star Trek type creatures from distant planets. There's a furry beast guy, serpentine guy, skull guy, and so on. 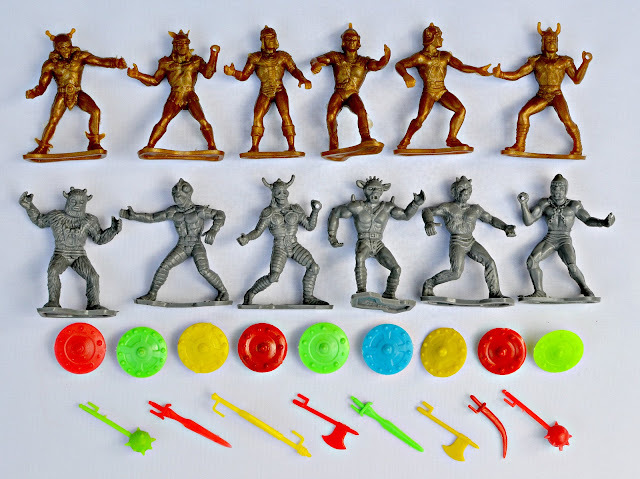 The playset also included a bunch of little weapons to go along with the figures, including swords, axes, maces and shields. Strangely, the weapons were made in very bright primary colors. I swear, the '80s produced the best toys--weird, cheap and charming. Warriors of the Galaxy is yet another example of that. For more information on the set, be sure to check out the previous post.